Artists naturally have concerns regarding both lack of fidelity and loss of control during the digital reproduction process. We aim to alleviate these concerns by consistently achieving the highest production standards, every time. Ideally our involvement would would begin with the initial image capture stage and follow right through to the print and finishing stages. Even with the very best available colour workflow tools, human skills are still a vital element in the process. In reality, there are no colour profiling systems that are able to entirely compensate for the subtle differences in scanner or camera response to the wide variety of pigments and surface textures that might exist in the artist's original. Beyond technical considerations, we believe it is vital that the artist is able to retain control of the process. In some instances the author may wish to make deliberate modifications to the image as it appears in the final print. Under the artist's direction it is possible to subtly enhance tone, colour and detail on a selected basis in order to achieve the desired effect. Further to this, we are happy to work with artists to revise image content through retouching or more extensive image editing. More involved work is normally undertaken on an agreed hourly basis. We are more than happy to estimate for any work of this nature. Clearly craftsmanship, skill and sensitivity are needed, in order to preserve the integrity of the artist's work. "Fine art is that in which the hand, the head, and the heart of man go together" - John Ruskin. We are happy to work from appropriate image files supplied. Alternatively, where artwork is stable and flexible we can produce high resolution reflective drum scans directly from the original. The maximum substrate dimensions for mounting onto the drum are 346 x 481mm with a maximum image area of 316 x 472mm. 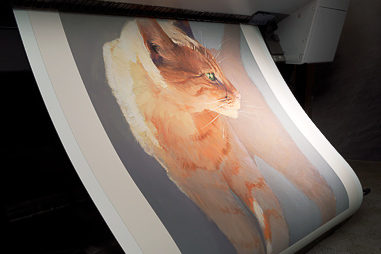 Where the art is not suitable for mounting onto the scanner drum, we can originate high resolution large format digital scanback captures direct from a wide range of fine art media. File sizes of up to 1 Gb in 16 bit (500 Mb in 8 bit) can be created. The entire workflow is tightly colour managed to ensure faithful reproduction of the original work. We can also originate high quality drum scans from existing large format transparency masters. We would be pleased to advise on the most appropriate paper or canvas to suit the original piece. We can also advise on appropriate finishing, mounting and framing techniques to enhance the presentation of your art. Giclée prints are output on an Epson 9900, 44" printer, for unrivalled sharpness, detail and smoothness in tonal rendition. The printer is coupled with a sophisticated RIP that incorporates what we believe to be the best integrated colour profiling module on the market. The print engine uses 10 colour pigmented inks which, when combined with the appropriate paper or canvas base, have excellent stability and predicted lightfast capabilities of 75 years or more. We use a carefully chosen range of substrates, including acid and OBA free canvasses and heavyweight matt or satin papers, all of which conform to Fine Arts Trade Guild conservation standards. Every print media has been thoroughly tested and custom ICC profiled to achieve calibrated, predictable results every time. Drawing on a number of years experience working with photographers from many sectors of the industry including abstract, landscape, mountaineering, still life, portraiture, life, and wedding, we are able to offer a bespoke ‘hand printing’ service. We believe that it is essential to fully understand the specific aims of the photographer in order to get the most effective results from each image. As with fine art work, we are able to capture high resolution digital files from paper, transparency or negative media. Scans are originated using the most appropriate technology – drum scanner, dedicated negative scanner or studio based scanback camera. As a matter of course, every image submitted for printing is checked for technical quality and optimized for the desired print media. Any issues or questions arising will always be reported prior to print production. We are pleased to undertake more complex retouching or image composition work on an agreed hourly basis. We are more than happy to estimate for any such work in advance.